*****"The story itself really drew me into the game and really made me want to keep playing..."***** -reloaded.org Prodigal features in-engine FMV, a first for an AGS game! It also features a soundtrack containing a wide range of music from horror beats, to classic blues, to the featured goth music band "Shadowplay." It contains a wide range of beautiful character art created in the Sierra style, drawn by the endlessly tallented Edgar Rocha. *****"...the game...sometimes even changes the graphic style to a sort of comic book style, which was very nice to see and really gave the game that much more polish..."***** -reloaded.org version 1.1 is out and recompiled on AGS 2.71 RC4. many bug fixes included, which you can read about in the version history document that comes with the game. "A solid game, only slightly let down by some graphical inconsistencies." I really enjoyed this game and I am looking forward to the sequel. To those wanted the last story, benjamin Johnson still working on sequel. Be sure to check his website. The download link of game is working! Give it a try! There lot of effect out into it! I've played many AGS games, and many great ones (Tale Of Two Kingdoms, Yhatzee's games, ...), but Prodigal might be my fave AGS game ever. It excels in transmitting a creepy atmosphere, getting an absorbing story through, and being entertaining with good puzzles and interesting locations. It is unbelievable how much work has been put in this game by Trisk with only a couple of others to help him. The sound and music in the game are excellent too. Still hoping that Prodigal 2 might get to see the light of day! There's definitely ALOT of effort put in the game, designing and rendering all these backgrounds, writing tons of narrator descriptions to every piece of materia around. A story has an epic underlying basis and the ending is surprisingly dramatic (unlike false-sweet happy ends so usual for similar kind of games). However, I must admit, there were some things in the game that made me feel uneasy, some points of imperfection. First are character sprites, especially demon ones, that looked somewhat inconsistent with those 3d backgrounds. While in the cabin it felt okay, but futher in game it looked like someone glued cartoonish character to photo image. Second is, perhaps, a sudden change of overall atmosphere happened after you left cabin and entered Demenza site. 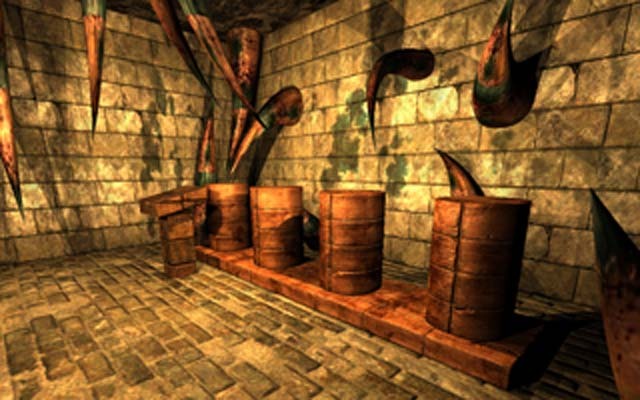 For me, personally, cabin was the most frightening part of the game, but Demenza part appeared to be rather comical in comparison. Last chapter reminded of older 1st person shooters, like Doom or Quake for some reason :). Amazing game! Reminds me of the Myst, almost. One glitch; when I was in the oily lake and tried to interact with the prison door using the hand, it still showed my character as being in the water. This continued on for one more room. I didn't find the story amazing, and the overall pace of it left me a bit bored rather than interested, but this game has nice graphics, wonderful cinematic cutscenes and a powerful atmosphere. I'll second the other favourable reviews. I usually don't like horror and I just wanted to give this game a quick try. But I couldn't stop until I completed it ! In a nutshell : amazing storyline, very professional graphics, very interesting puzzles. I can't wait for the sequel, if any. I liked the fact that most of the puzzles were right/easy (I hate when I get stuck, and usually in adventure games I get stuck a lot, in this game just a couple of times). Also I like the fact that there are a lot of rooms, caves, etc to explore. When some other game and/or a second part? Well I already told both the developer and the gaming public on my own freeware gamesite, that I love this game. Great work indeed and definently on my top 15 Freeware games of all times list. Maybe even the top 10. And there are a lot of competition. I really liked this game, it had alot of depth, and it was fun to play overall. Some of the puzzles were a bit silly or obscure but they were still good. Im not very sure if its a full-length game, but it took me about 3 1/2 hours to play through. This was a pretty good game. I say so because while the game overall was solid, there was, in my opinion, some room for substantial improvement. From a technical standpoint, the game was pretty much flawless. A few pathing errors here and there were irritating, but nothing worth noting specifically, although a speed slider for Jacob's walking would have helped. By the time I got to the ending, I was rather lost--the whole story was a bit unfulfilling all-in-all, and I saw the ending coming a mile away. There are also several idiocyncracies in the storyline that bothered me--for example, why would a foreign demon world of darkness possibly created by Indians have mounting brackets held together with screws? Artistically, the game looked nice overall, although the demon models were a bit too over-the-top to scare me. More subdued but menacing models might do better--or just keep the demons out of sight (as you do in several scenes). Despite these flaws, I loved a lot of the game--puzzles were intuitive for the most part, etc.--and would love to see a sequel! I loved this game, I am a huge fan of horror games, and I just happened to stumble upon it one day, and tried forever to to download it (it took too long, I'm impatient). I played through it in about 2 hours, perfect for my tastes. The graphics are wonderful. The story is fantastic, award well deserved. 9/10 for the history with the scholar being too slow, but other than that, one of the best games since 5 days. So, why are you still reading this? Go play it, NOW!! I loved this game and couldn\'t stop playing it. It showed creativity, imiganation and some awesome graphic skills. Looking forward to the sequel!!! A brilliant title worthy of any actual full priced release I have played; the most enjoyable thing I have played in a while. The amount of effort that has been made here is obvious so I think it only fitting to give as detailed a review as I can! The normal in game view was detailed and the interface was much better than some I have seen. The video sequences were also very impressive and the mixture of comic style graphics in some places was very original. I also liked the way you handled all of the animations for this game. You are told enough about the characters that you actually care about what happens next. The movies are a key reason why the game draws you in at times; the comic graphics were vital with regard to immersion as they let you actually see what the main characters looked like (which is obviously very limited in the standard view). Excellant sound and music. Not too hard and not too easy; a perfect entry level game for a new player but hard enough in places to really make you think. I like the way you never have to travel to far if you miss an item, that was a key part to the enjoyment. It also felt like something was always happening and there was a definate flow at all points. Very amusing story line together with a nice level of difficulty makes this a very enjoyable experiance. It demands a sequel! Really enjoyed playing this game, I could not stop until i was finished. Cant Wait for a sequel!! this is a really great game. you can see a lot of effort has been put into even the tiniest details. and the story is one of the best ive seen in a game (commercial and ags). This was an enjoyable game to play with an interesting storyline........Very professional in my opinion. The graphics were good and a lot of care and thought seems to have gone into it. Thanks for a neat game. J.C. Excellent game! Looking forward to seeing more work. this is a very awesome and inspiring game. i can't wait for the sequel. A lot of time and effort has obviously been put into all aspects of creating this game. Technically, Prodigal has been well designed and implemented, with great graphics and sound that create a superbly chilling atmosphere. And what a FANTASTIC story. Stefano was spot on, once I started playing, I couldn't stop until I'd finished it. Congratulations to all involved on a great game!